We get it finding the right fragrance that you love is hard. That is why we created The Lore Promise. An easy way to shop fragrance online without the risk. 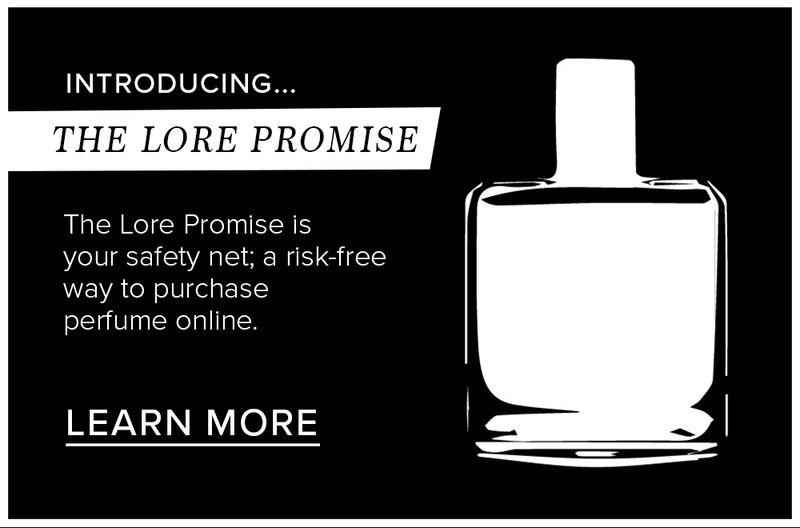 Purchase any fragrance from our website and click YES to receive The Lore Promise at checkout. After you have received your order, DO NOT open the fragrance packaging and use your Lore Promise sample that has been sent. We will reply with a shipping label for you to send the fragrance back. It is your responsibility to ensure the product is packed safely to avoid breakages. Lore Perfumery does not take responsibility for damages in transit. Please allow 48 business hours to hear back from us with your label. A shipping label will be emailed to you for you to print off and apply to the box. You will also receive a manifest paper to print off and sign. You will need to take the box with label applied and signed manifest to your nearest Australia Post store. Lore Perfumery have the right to decline a return if the product is not in it’s original packaging, has been opened, has been used or damaged. Final inspection and decision will be made by Lore Perfumery. Once we have received the return and have approved we will provide a coupon code to use on the Lore Perfumery website for the amount of the fragrance returned. Please allow 48 business hours after receiving your return to hear back from us with the coupon code. The Lore Promise conditions are in the form of exchange only and no refunds will be applied. The Lore Promise applies to fragrance only (excluding roll on products) with a retail value of $50 or more. In store exchanges are welcomed and the customer must bring in proof of purchase. Samples are only available for The Lore Promise and will not be sent out without purchasing. Our policy lasts 14 days. If 14 days have gone by since delivery, unfortunately we cannot offer you a refund or exchange. To complete your return, we require an email with order number, image of faulty/damaged product and your reason for return. If return is approved and it is a change of mind, postage will be at the customer’s cost. In the unlikely event that you receive an item that is damaged, incorrect or faulty, please contact our team at hello@loreperfumery.com.au – We will reply to your email as soon possible and get things sorted for you. Please note: You must contact Lore Perfumery via the email address above and receive approval and a return form before you send anything to us. If you’ve done all of this and you still have not received your refund yet, please contact us at hello@loreperfumery.com.au. We only replace items if they are defective or damaged. If you need to exchange it for the same item, send us an email at hello@loreperfumery.com.au and someone from our team will be in touch. To return your product, you should mail your product to: 313 Brunswick St, FITZROY, VIC, 3065, Australia. For change of mind returns – You will be responsible for paying for your own shipping costs for returning your item. Shipping costs are non-refundable. For faulty items – a pre-addressed bag will be sent to the customer for return. Your order will be shipped within in 1-2 business days. Please allow 3-7 business days for delivery. *Peak periods such Public Holidays and Seasonal Holidays can experience longer shipping times, please allow an extra 1-2 business days for your order to be shipped. All orders will be shipped via Australia Post. We take no responsibility for incorrectly typed addresses and all orders will be shipped to whatever address is listed in the address section. It is the customer’s responsibility to supply a safe and easily accessed delivery address. Please leave any relevant notes in the ‘delivery notes’ section at checkout. Lore Perfumery is not liable for any attempted deliveries that were unsuccessful due to the above reasons. It is up to the customer to follow up any unsuccessful deliveries. Shipping is free for all orders of $150 or over. Orders below $150 are charged a flat delivery rate of $9.95. Unfortunately, we do no ship internationally. Once your order is shipped you will receive a confirmation email from Lore Perfumery which will include your Australia Post tracking number. Please visit: https://auspost.com.au/parcels-mail/track.html to track your parcel.